Kim "Roach" Kang-hui will join Gen.G Esports' League of Legends roster, the team announced Tuesday. Roach will join Lee "CuVee" Seong-jin in the top lane, ​who renewed his contract with Gen.G Nov. 23. Roach will take the place of former top laner Moon “Mong” Chang-min, who left the ​League of Legends team Nov. 17 after joining in May. Introducing a new addition to the Gen.G LoL拾! 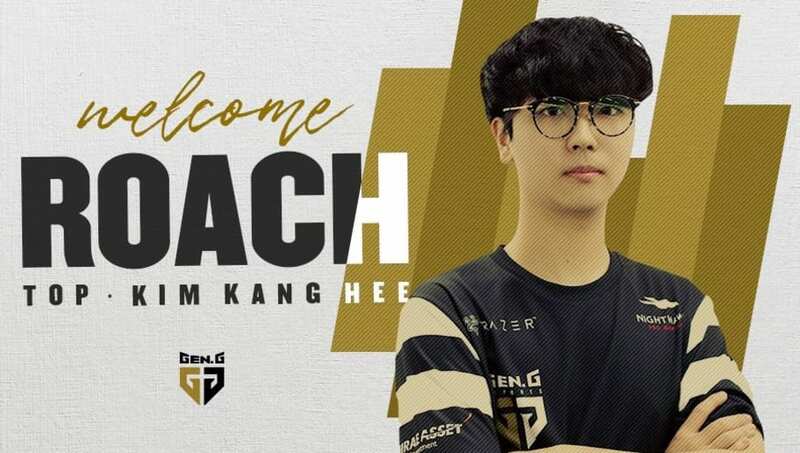 Welcome Top Laner 'Roach' Kim Kang-hee to Gen.G esports! 젠지 LoL팀의 새로운 식구를 소개합니다! Roach began his career on NaJin e-mFire in December 2015 and stayed on that team through the next three years and two name changes, taking the team first to e-mFire, then to Kongdoo Monster. He was with the team ​when it disbanded Nov. 5, sending him into free agency. Roach's arrival on Gen.G was preceded by the team's ​acquisition of star League Champions Korea jungler Han "Peanut" Wang-ho Nov. 24. Gen.G has also released players, ​including Kang "Ambition" Chan-yong and Lee "Crown" Min-ho, who left Nov. 16. Crown ​went on to join OpTic Gaming Nov. 25, while Ambition remains teamless.